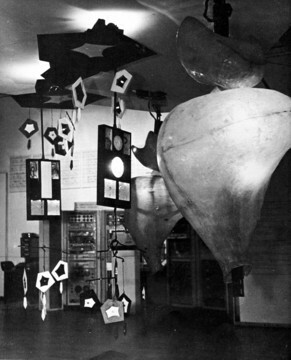 The English cyberneticist Gordon Pask conceived the Colloquy of Mobiles for the 1968 exhibition Cybernetic Serendipity held at the ICA in London. It was a reactive, educable, computer-based system composed of five mobiles. By way of light and sound, the rotating elements suspended from the ceiling communicated with each other, independent of external influences. Using flashlights and mirrors, the people at the exhibition could nevertheless take part in the conversation between the machines. With this installation, Pask brought to a conclusion his idea for an «aesthetic potential environment».